One of my favourite Apple adverts starts with “here’s to the crazy ones…” and it can be found Here. Please watch this first before reading the story below. I see a bit of Neil in these people. You see, golf is traditional. VERY traditional. It takes someone brave and bold to challenge the status quo and jolt the system and this is exactly what he is doing. Neil is pushing the boundaries and making it uncomfortable for those that have worked the same way for years. And personally I love it!!! This is a truly moving story and one that will make you smile, as you can imagine watching the events unfold. Sit back and enjoy! I spend the majority of my time coaching children, in schools, the local community and on site at Cuckfield Golf Centre, West Sussex delivering JOLF. A specific playing – learning – competition framework for children. During JOLF sessions we aim to deliver a Fun, Engaging and Appropriate experience to each child, every time. Cuckfield Golf Centre is a 9 hole child, family and beginner friendly facility that is quite different to a traditional golf facility. There are very few rules and regulations that people have to adhere to and this lends itself well to people who are looking to start playing golf. In that respect we have a huge advantage when people walk through our door to start playing the game. I love sharing time with children and providing opportunities for them to fall in love with the game but I also gain tremendous satisfaction from introducing adults to the game. Thank you to Nick for providing me with the opportunity to share one of my coaching experiences. When he said pick a favourite coaching moment these 2 ladies immediately sprung to mind. The process of writing this has given me the opportunity to reflect on what I do with new players and compare to what I used to offer. As well as look at areas of improvement. It is so easy to do what I have always done and impose the game and it’s rules and regulations onto people, as opposed to providing them with a unique and appropriate experience each time we share time. Sarah and Dawn had booked themselves in for a free taster session. 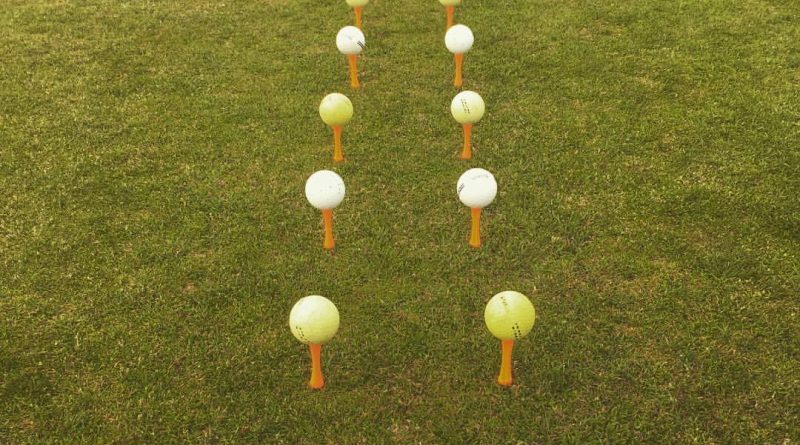 This session is often an introduction to the centre as well as an opportunity for them to hit balls for the first time. Sarah had hit some balls on a range before (she said she had never played on a golf course though) and Dawn had never entertained the idea of playing. They were pretty normal customers of the centre who had been along for coffee and cake, had no equipment, no experience, little expectation of themselves or what was ahead of them. As mentioned above the first experience is meticulously planned to introduce them to the centre and put them at ease. My main aim? Enthuse them to come back and do it again! My main aim? Enthuse them to come back and do it again! In the past I would have imposed on them an approach that would have embedded the basics (grip, aim, stance, posture, ball position and the “correct” way to swing) before they ventured near a golf course and then if (and this was a big “if”) they continued they would be encouraged to become members of the club, gain a handicap and play in competitions. This approach never really took into account what they wanted from the experience and it is now obvious that many who started with lots of enthusiasm soon stopped when they realised there was only one path to take. I now realise that everyone treads their own path on this earth and I just meet them as our paths cross. I feel that I am more of a guide and facilitator of experiences that I feel they will enjoy and will enthuse them to come back and do again and again. My main aim for beginners is enthuse them to return to the next session and also enthuse them to search out opportunities to play in their own time. Sarah and Dawn were nervously embarking on a journey that they had no idea what it would involve, how long it would last, who they will meet along the way, how it will make them feel and much more unexpected twists and turns. Our taster session started with a chat while they finished their coffee, I wanted to know more about them, what they knew, what they wanted from the experience, and what they expected from me. They said “we are in your hands” so off we went to the putting green to get them started. Putt from 1 foot, 2 feet, 4, 8 and 16 feet were my first instructions after handing them a putter and a ball each. “Let’s see what you can do…” I said. “But how do we hold it? How do we stand? I have never done this before!” They asked nervously. “Don’t worry, you will be ok, let’s just see what you can do” I said with an encouraging smile. They both putted from 1 foot, the ball went in, they smiled and they were on their way. Little mention of how to do things but lots of guidance and support while introducing them to putting, chipping, bunker play and “whacking” on the driving range followed and the time went quickly. They were hooked!!! The first question asked as we finished was what happens next? There is only one answer, next time lets get out on the golf course and show you what they game is all about!!! In the past this experience would have been left until they were “ready” normally at the end of a series of sessions! Now I am keen to get people on to the golf course as soon as possible and on some occasions even the first time we meet. This allows people to understand the context of the game and any experiences that follow will be learned and understood in the context of the game. For their second session they again arrived in plenty of time and took the time to chat and have a coffee, when it was our time to start I gave them each a small set of clubs and off we went. My aim was to play a number of holes, them carrying their own clubs, hitting shots from different parts of the course (driving, fairway shots, bunkers, putting etc) but most importantly moving around the holes briskly. I have found that novice players are most intimidated by other people on the course, so knowing how to move around the course briskly is an important way to enthuse them to go out again. Often it doesn’t even matter to what level you play at as long as you can move briskly, safely and fairly around the course. Following this second session they then regularly started to come to the centre on their own, for coffee & cake as well as playing on the putting green and driving range. They started in October so were starting in possibly the worst weather and at a time when the golf course was getting wetter due to extreme rainfall. I had to factor this into my plans as it was going to be difficult for the ladies to access the golf course while it was so wet. At their request after the first 2 sessions where they shared the session they then wanted a number of sessions on their own and focus on hitting the ball better. This led to one of the nicest moments of our sessions. Dawn had struggled so far making bigger swings/movements to send the ball further (although had been superb when putting on the green). She had shared that she had done very little sport in her life (citing that she did not like doing PE at school, a statement that I often hear!). I had encouraged her to move as much as she could, moving the club around her body and creating some speed, this way if the ball got in the way of this movement she would see it move forwards. That moment came during one of our range sessions when her movement and the middle of the golf club found the ball and it sailed 30 yards in the air. She looked at me with a huge smile on her face and said “I could kiss you” Nothing to do with me I said; you were moving the club and you hit the ball, nice job! Still very little “technical” input from me, I was still just encouraging and guiding them to move the club and their bodies at speed. They were missing the ball less, more balls were going in the air and they were improving. Sarah came along to a one session and announced she didn’t know if she was right or left handed, we had spoken about this at the beginning and I thought she was quite sure she would play right handed (she had even purchased some equipment!). But she was still not sure, so we spent some time with right and left handed equipment to see which way around she was more comfortable playing! And unusually she did just as well, and missed the ball the same amount, both ways. I was confused and she couldn’t decide! I had never had a situation before where someone was just as competent hitting right and left handed. Finally she decided that she would play left handed, sold her right handed set, purchased a left handed set and she was back on track! They attended our weekly ladies clinic meeting others who were at a similar stage to them. Fascinating to observe them in this situation where they were able to compare their skills to others. This came to a head at our annual Christmas clinic where we had all standards of ladies attend, playing games and challenges. They saw all of the other ladies who had played regularly for a number of years. A moment where their enthusiasm might have dipped? No doubt they were intimidated like a lot of the other less experienced ladies were, but this opened up a lovely conversation with them about how far they had actually progressed in a short period of time. And I have regularly asked them these questions also. There regular answer has been for them to make more time to come along to the centre to play and practice. They did! They booked a tee time (when the course was quieter) I arranged to meet them before the start to answer any last minute questions. They were nervous, and so was I! It was a similar feeling to sending my children off to school for the first time! I was excited and nervous all at the same time. But they had a great time and agreed that knowing where to go would be something that will only get better the more they play on the course. They are now golfers, they have clubs, they can play on the golf course, they can hit shots in the air and they are on their way. Each of them following their own path and coming back for guidance and support when they need it. Will they join a golf club? Not sure. Do they want to get a handicap? No idea. Will they play in competitions? Who knows! But… they have the choice to go and play on the golf course. I did suggest to them that one day they might just walk around the golf course so as to get their bearings so when they went out to play again they would be less likely to get lost! My approach to coaching beginners has changed dramatically over the years. From the beginning where it was vital they were introduced the correct technique and focus was on hitting the ball on the range well before venturing onto the golf. Now it is more a case of introducing people to the game of golf, getting on the course as soon as possible and letting the skills and technique emerge from playing the game. This approach of playing on the golf course is also the same with people that have played before and want to improve. There is no doubt a time and a place for technical instruction on the driving range but I feel golf should be learned on the field of play. The joys of sport makes these stories so heart-warming. Whilst we might be in the middle of a European Football tournament which is all about high performance sport, this is what the 99% of the game is about. Coaches like Neil make this happen on a daily basis.